An underlying assumption of exercise and sport psychology is that physical activity, broadly defined, has psychological antecedents, consequences, or both. In his Exercise Psychophysiology Lab, Steven Petruzzello examines the role of low-to-moderate and vigorous exercise and physical activity performed in extreme environments on a variety of psychological outcomes. Across a continuum ranging from such ow-to-moderate activities as walking, cycling, and running, to vigorous activities such as competitive swimming and running, his research aims toward a more complete understanding of the psychophysiological impact on the individual. He has focused not only on the pre- to post-exercise changes that occur, but also the in-task changes. Ultimately, he hopes to develop a better understanding of how exercise makes people feel in order to enhance adherence to physical activity. 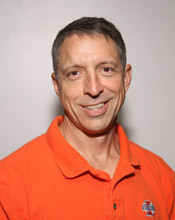 Dr. Petruzzello's research is driven by his desire to answer the following questions: How does exercise influence how people feel during and after they have exercised? For example, do they feel exhilaration, distress, fatigue, or boredom? How do individuals differ in their preference for and tolerance of different levels of exercise intensity, and does that preference or tolerance influence how they feel? How do these factors influence the enjoyment of exercise and the motivation to stay in an exercise program? How are such cognitive functions as decision-making ability impacted by exercise in extreme conditions such as firefighting? The overarching and most important goal of Dr. Petruzzello's research is to determine the psychophysiological mechanisms underlying the effects of exercise on affective and cognitive changes.